Sunday the 17th of August saw South Brisbane Rotaractors heading to Carindale to assist with the 10th Annual Brisbane Billycart Championships. It was an early start on a damp day but the weather quickly fined up and an enjoyable day was had by all. 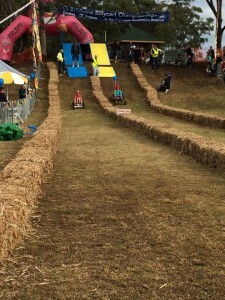 Rotaractors helped out on the day with marshaling, handing out numbers to race winners, lining up hay bales, helping the little kids get themselves and their carts back up the hill and encouraging the racers from the sidelines! Some highlights from the day include the mascot race and the 4 to 6 years traditional cart race (with some spectacular crashes into the hay!). Prizes were awarded on the day for Fastest Billycart, Winners of Age Categories, Most Imaginative Design, Best Stack and Best Dressed Team. This entry was posted in Uncategorized by rotaract. Bookmark the permalink.